Keep the burgeoning village of Headshire happy! 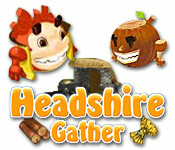 Gather much-needed resources but watch out for ravenous skulls and quicksand in this Arcade game.Return to Headshire!In your post as Governor of Headshire, you must gather resources to keep your town happy. Collect much-needed items while dodging dangerous pools of quicksand. Avoid the skulls; they'll sap valuable seconds from your day. Keep your eyes peeled for valuable coins and gems! Meet the quota for all of the resources before nightfall so that everyone in Headshire is happy, well-fed, and warm!